Millennium 7 Publishing Co.: How Facebook's Changes Impact YOUR Social Media Marketing? 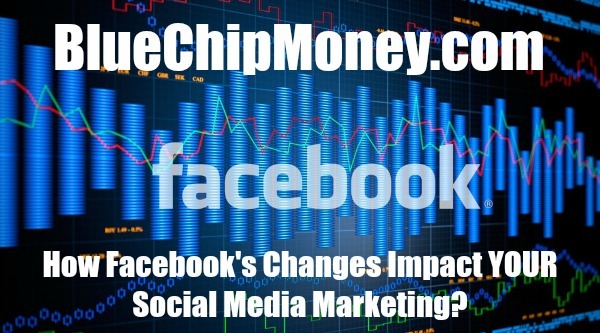 How Facebook's Changes Impact YOUR Social Media Marketing? How Facebook's latest changes impact influencers and the future of social media marketing? Once again, Mark Zuckerberg shook up the world last week when he announced Facebook will change its algorithm to promote more personal content rather than news. Since obsessing about Zuckerburg’s net worth has never yielded positive results for me, I instead called over our Social Media Strategist, Thomas Drew, to discuss the current social media environment. Our conclusion was this: What’s bad for businesses is good for Influencers. With new regulations on data (see GDPR) and less material from media outlets and businesses organically making Facebook users feeds, the stock of Social influencers will continue to rise. Let’s dive a little deeper to understand how this affects the full ecosystem, whether you’re a business, influencer, or marketer. Since Instagram’s algorithm is beginning to mirror Facebook’s more and more, expect to see more organic content from people, and less from brands and businesses in 2018. What must be noted during this change is that Influencers are, and have always been people first, and content marketers second. Every influencer, no matter what the niche, has their own content style that, for whatever reason, resonated with their audience and caused that audience to explode. These influencers and their audiences will garner even more attention with their organic content, while similar, non-paid content from businesses and brands will suffer. This isn’t the first time Facebook has radically shifted its model. So what does all this mean for Influencers, Business and the Future of Social Media? I remember when Instagram and Facebook were chronological. You followed people to see their content, and that content was shown to you in the order that it was meant to be seen. Strategies were less complicated, control was with the user, and all was good within the social world. Then BOOM! The infamous ‘algorithm’ of late 2016 hit. Facebook and Instagram limited your reach to 30% of your total follower count on average, allowed the algorithm to decide what content should be displayed in your feed, and Social Media was forever changed. Free flowing content turned into regulated content, and the reach of business profiles were reduced, causing them to pay for ads just so their content could be seen. All facets of the marketing ecosystem will be impacted. If you’re an Influencer, you just leveled up even further. Connecting with Influencers who have a growing audience that they truly understand will be at a premium for most marketers. It will continue to be the most effective way to influence consumer behavior via social media and beyond. The key is for Influencers to have a deep understanding of their followers and of their brands equity. The real question is, will Facebook begin to regulate Influencers and treat their organic content the same as businesses? Will they use the algorithm to measure the amount of posts from Influencers that seem to contain brands either in the content or caption and begin to penalize their reach just like the media companies and businesses? After all, Influencers began their accounts as regular people, connecting with friends and family and not partnering with brands. Time will tell. The good thing about social media is that with the right data and proper social listening, you can unearth your target audience and figure out which Influencer speaks to them. Picking an Influencer that has a lot of followers in your niche, telling them to post your brand or product, and tagging your account isn't Influencer Marketing. The best way to utilize an Influencer’s audience is to understand your objective, learn about the factors that influence your target audience, and activate an Influencer that blends your brand or product narrative seamlessly within their own. I call that “equity match making.” That’s when you get comments like, “This is the best ad I’ve ever seen!” or “This should be on TV,” while satisfying your objective and growing your business. That’s the Holy Grail of Influencer Marketing. In order to stop the spread of fake content, Facebook has decided to show you less business and media content, and more “people content” — content from the individual users. But if businesses execute even more influencer marketing through these individuals that are Influencers, where will they draw the line? Will they regulate that as well? These questions will be answered over the next few months, but one thing is for sure: Facebook will find a way to increase shareholder value and it’s going to come at the expense of brands. Guest Authored By Keenan Beasley. Keenan is the co-founder of BLKBOX, an integrated marketing agency based in New York City. He is a graduate of the United States Military Academy at West Point. Follow Keenan on Twitter.